"That's pretty, but will it stain or fade if I kiss?" This year I've noticed that my lip color preferences have been taken over by longevity. While I do enjoy a creamy lipstick, a shiny gloss or a strong full coverage matte lip - if it's a date night I'm more drawn to a long-lasting formula than wiping off stains from my boyfriend's cheek. Here are my tips for a long-lasting lip color and a couple of product favorites. No lip color, especially matte or liquid lipsticks, look good if your lips are very chapped or parched. One of my favorite ways to exfoliate my lips is by mixing sugar with thick lip balm (such as Nuxe Reve de Miel) and scrub away. 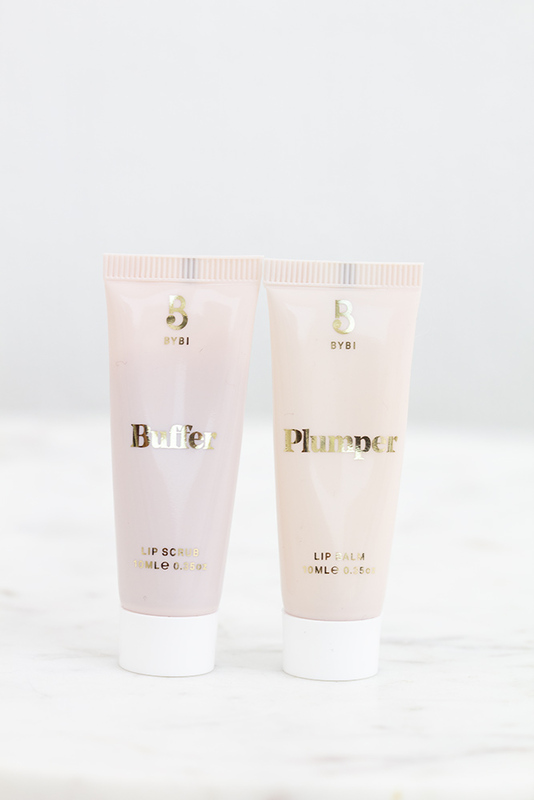 Lazy girl’s version is by using BYBI Beauty’s lip Buffer*, which also conditions the lips. It’s not very abrasive scrub so I rub vigorously before removing with a tissue. 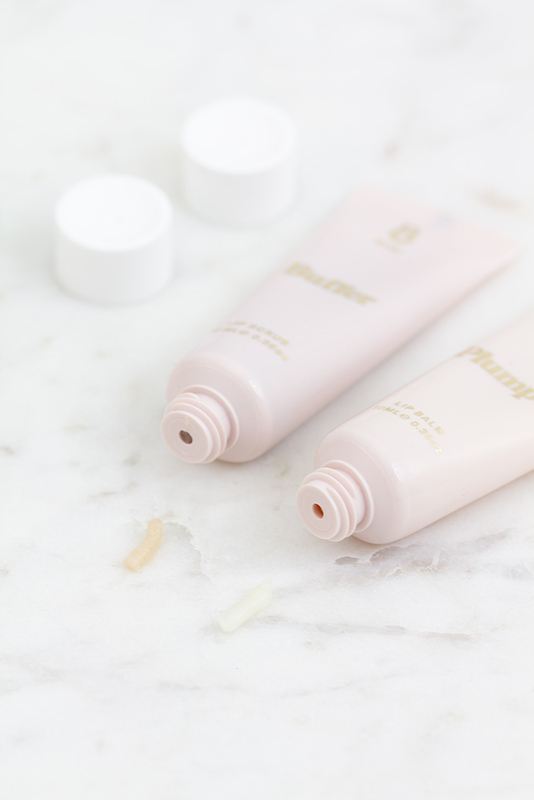 The Plumper* is a balm with a minty feel, but I the plumping effect is from natural moisturization instead of tingling. In Finland BYBI is available on Jolie.fi* and Twistbe.fi - who also have a super cute set*. Lip balm - as much as we love it - is the devil when you want a long-lasting lip color. Add the balm when you start out your makeup routine, but make sure to rub it off with a tissue before adding any color. This slight rubbing not only removes the extra slip of the lip balm, but the last bits of dead skin - giving you even smoother canvas! Classic, obvious, but so good. You don’t only line the outside of your lips for the perfect shape, but color your entire lips with either 1) “my lips but better (MLBB) shade” or 2) something closely matching your lipstick color. This matte and even surface makes your lipstick glide nicely on the top, but also gives something to stick to. When your glossy lipstick fades, you still have something underneath and there will be no color left on the cracks of your lips. Here I’m using the trusty ol’ Charlotte Tilbury Lip Liner in Pillow Talk* and lipstick in Stoned Rose* I shop at Cult Beauty. 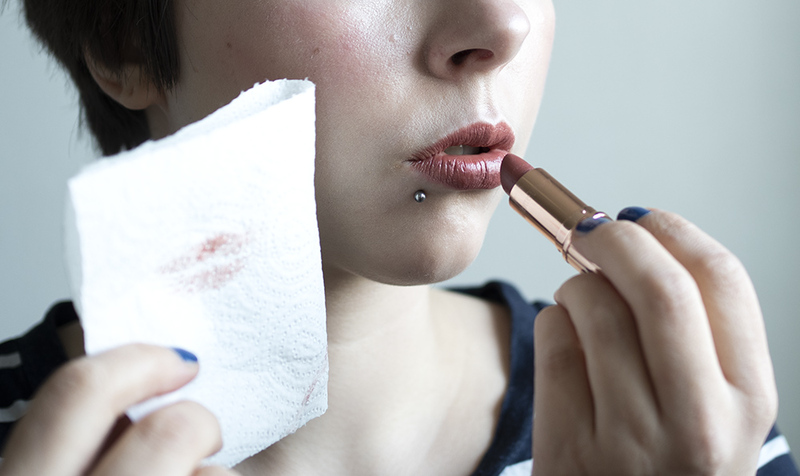 You apply lipstick, then either press a tissue against your lips or bite a tissue. Apply some more lipstick, just one layer and blot again. This layering technique works for a variety of lipsticks, making them last longer and a bit more matte looking. Lip tints are my best friend when it comes to a long-lasting lip look. I especially love the Lancome Matte shakers (available in Finland at Kicks.fi, Sokos, Stockmann), but unfortunately we have a very limited shade range in Europe. This lip color leaves a nice stain after the majority of the color wears off. If you’re not into the Lancome shades, look into Korean lip tints and tint waters, but not liquid lipsticks - they can be too drying. I’ve noticed that jumbo lip colors tend to be created for all-evening wear. Also try dabbing a matte lipstick with a finger to your lips for that diffused, modern, hazy look. My favorite formulas are by ADDICTION and ‘Crushed’ formula by Bobbi Brown, which leaves a ting to the lips as well. Did you learn any new tricks? Are you a lipstick or a lip balm person? *BYBI Beauty products were kindly gifted for consideration. Cute millenial pink packaging, cruelty free, 100% natural and a price point that doesn't make your choose between beauty and your rent. That's BYBI, a British skincare brand launched in 2017. While the range is well-curated and simply adorable on the outside, does the skincare actually perform? 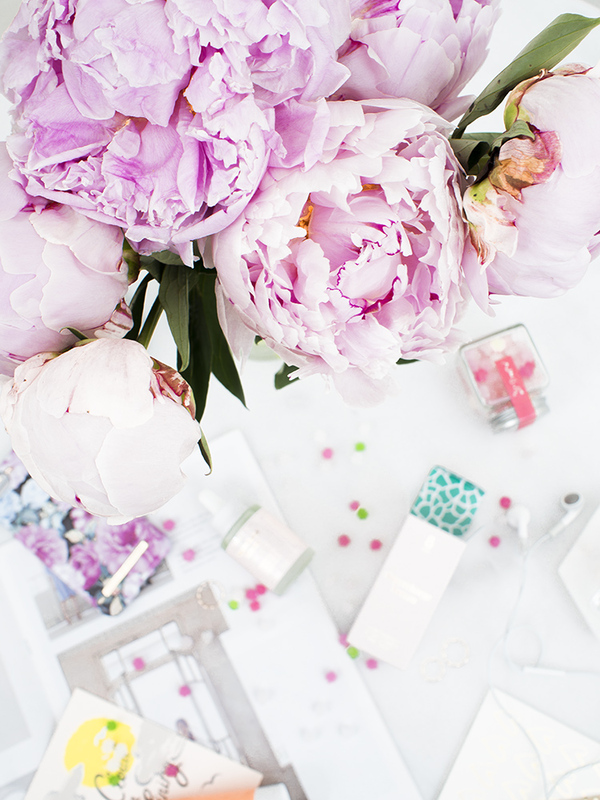 Today I'm taking a look at their Supercharge Serum* and sharing you my thoughts! Enjoy! This natural facial serum is designed to be potent, nutrient-dense yet light and fast-absorbing in texture. Unlike many eco facial oils, the Supercharge Serum has almost a transparent color and the blend of natural oils and essential oils are in a squalane base. Suggested use is in the mornings for a fresh, dewy look or as a night treatment before, in place of or added to a normal moisturizer. Packed in a glass bottle with a pipette dropper. 30ml / 1.018 fl.oz. for £32 or 38,90€. 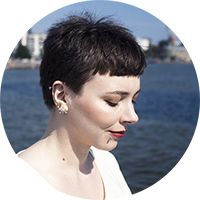 In Finland you can find BYBI from Jolie* or TwistBe*. BYBI was a completely new brand to me and I had to do some research who/where/what was it all about. The packaging is very cute millenial pink, typography is smart, overall the look is very Instagram friendly (and my graphic designer's heart is very happy). The price point is moderate/affordable if you consider the fact these ingredients promise to be high quality, 100% natural, vegan and cruelty free. The name BYBI stands By Beauty Insiders and the brand is founded by Elsie and Dominika, who are both UK beauty bloggers, consumers and formulators. They wanted to create a transparent brand based on their knowledge and bring something fresh to the market. I've used this product as my serum step before a moisturizer (AM routine) or sealed under a nourishing beauty balm (PM routine). Despite testing the product during the heatwave that was scorching Europe, my skin wasn't left looking or feeling like a grease ball. BYBI describes the oil "almost like a dry oil" and I can agree - it sinks in very quickly, leaving the skin looking fresh and moisturized. I have a firm love for heavier, opaque colored eco facial oils, but it was wonderful to reach for something lighter during the hotter months. I take a generous amount (more than 4-5 drops), press my palms together and then press and roll on my face, neck and décolleté. The scent is slightly citrusy, but not overpowering. I almost always prefer a dark opaque bottle for packaging to protect the product from light, but I guess the oils in BYBI's formula aren't that 'sensitive' type? I'm used to droppers but BYBI's is a tad flimsy as the glass pipette once fell off from the plastic pipette. Nothing was spilt and I pressed the glass part back to it's place, but as a consumer I don't want to think or be careful with the packaging. So that's a minor minus point, but otherwise I would travel with this serum despite the glass bottle as it does work very nicely under makeup. The base of this serum is squalane derived from olives. SqualAne is a hydrogenated version of squalEne, but not subject to auto-oxidation ie. it has a longer shelf-life. They're both naturally occuring compounds of human sebum and won't irritate or sensitize the skin. Squalane is a popular emollient and moisturizing agent in a lot of skincare as it absorbs quickly, making the skin nice and plump with no greasy residue. Looks like BYBI has chosen a lot of other very moisturizing, antioxidant rich and stable oils for their formula, such as meadowfoam seed oil and Japanese camellia oil. I could find only little info on the second ingredient, kuikui or candletree oil, but meadowfoam is another fast-absorbing oils that locks in moisture and delivers nutrients into epidermis. There's also Tocopherol (Vitamin E), evening primrose and prickly pear seed oil. Especially prickly pear seed oil has been popular in green beauty as it has high olinoeic acid and antioxidant content. After a few flower oils there is a surprising amount of fragrant ingredients, most likely naturally derived, but they are possible irritants and allergen (Linalool, Limonene, Eugenol etc.). It's weird because the Supercharge Serum has only a faint citrus smell that doesn't linger. So why the need for fragrance? Luckily I haven't had any issues while using this oil, but if you're very sensitive or have issues with essential oils I'd patch test or give it a sniff first. I think Supercharge serum would suit the best for reactive, perhaps acne-prone and oily skins as the comedogenic rating of squalane is very low, but it provides well-needed moisture for the skin. Just be cautious of the fragrance. 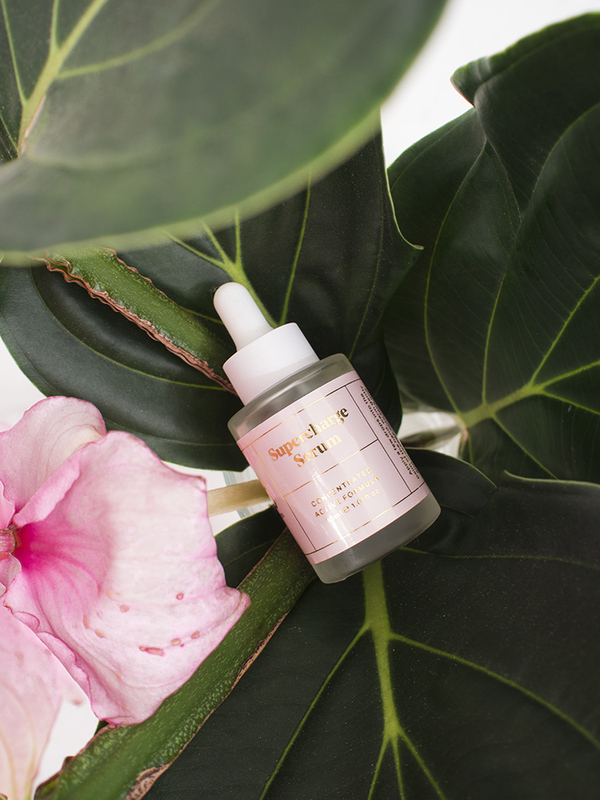 If you have more mature or very dry skin this serum alone might not be enough for you, except if you enjoy a lighter and fast-absorbing oil under makeup. As I mentioned before, BYBI was a completely new eco brand to me and I had some healthy scepticism that something so cute wouldn't be effective.. silly I know and I'm happy report I was proven wrong! I thought the range would be only aimed towards younger audience judging by the pink packaging and lower price point (with eco oil serums the prices can be in 3 figures), but so far the products I've tried have won me over. I'm glad there's a range with an oil serum that is both aesthetically fresh but also won't break the bank. *This product was kindly offered for consideration. My thoughts are unbiased, honest and my own. Summer came early this year to Helsinki. We had unusually warm days in May, early June and now there's a heatwave again! Don't want to complain, but we don't have AC's at home and it's impossible to.. well, move or do anything without breaking a sweat. I haven't been wearing a ton of makeup, but piling on sunscreen and sweating my face off has made my skin feel a bit grubby and congested. Masks and scrubs to the rescue! After posting a recent scrub + mask routine on Insta Stories, my friend Kia asked my thoughts; I got inspired to share them with everyone with additional exfoliating products. You see, I've never been a heavy peel/scrub type of a person, but I've used chemical exfoliants (BHA, AHA) in my daily routine for years. After some searching and testing I've found hits from each category: masks, scrubs and my favorite toner. If you're not familiar with exfoliating, just drop me a message in the comment box and I'll do a more thorough post on the subject. Daily exfoliating is a key for smooth and even skin tone in long-term. Exfoliating is basically removing the top layer of dead skin cells from epidermis (top layer of skin), which also happens naturally through cell turnover. Our skin generates new cells from dermis and replaces the old cells on the top, but as we age this cell turnover slows down. Too many dead skin cells can make the appearance of the skin look uneven, dry, clogged or lackluster. By exfoliating we can gently reveal younger and "fresh" cells and improve our skin tone and texture. Treatment products such as essences and serums also penetrate better freshly exfoliated skin. Everyone can exfoliate (face and body) despite your age and skin type, but for daily use and sensitive skin types I recommend gentle products that help to improve the appearance of the skin over time. Some people tolerate more abrasive products than others (such as BHA), but you can build up tolerance for exfoliating acids over time. Personally I'm a huge fan of gentle exfoliating as a part of my daily skincare routine. I find it has helped me to diminish the appearance of my acne scaring, clogged pores (blackheads) and overall tone. I have dry skin so I try to exfoliate my body at least 2-3 per week to avoid "lizard skin" on my legs. After exfoliating make sure to moisturize and use SPF as the skin may be sensitized! 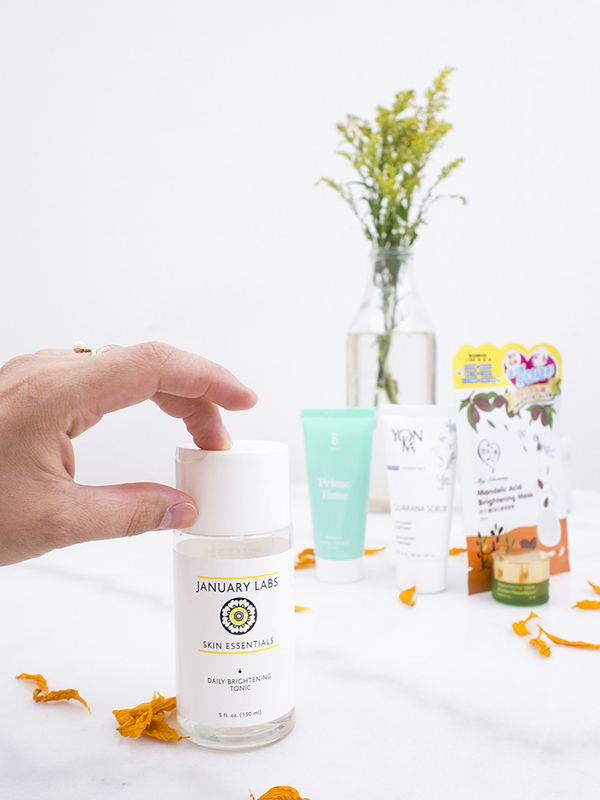 I've talked about my love towards January's Daily Brightening Tonic* in this post and I'm currently on my second bottle. The main exfoliating ingredient in this toner is lactic acid, which is a very gentle exfoliating acid with humectant properties. Lactic acid has a slightly larger molecular size, so it won't penetrate too deep causing irritation, but still loosens up the bonds between dead skin cells, revealing more plump and fresh skin underneath. The January Labs Daily Brightening Tonic also has soothing aloe, moisturizing glycerin and sodium PCA with oat kernel extract that condition the skin. In other words, I'd say this toner is very nicely balanced as it exfoliates while treats the skin as well. 150ml / ~29.05€ from Cult Beauty*. After discovering peeling gels I didn't reach for scrubs for a couple of years, but now I've introduced them back to my weekly routine. Scrubs are exfoliators with particles such as seeds, sugar or beads that rub off dead skin cells. Harsher particles are excellent for thicker body skin, but for the face I recommend looking for a gentle scrub and absolutely no plastic beads! My recent favorites are from eco/eco friendly brands called Yon-Ka and Bybi Beauty. When I'm feeling particularly grimy, sweaty or have worn tons of makeup I want to make extra sure my face is properly double cleansed and exfoliated before adding any treatments or serums. What exfoliating products have you been loving lately? * Products marked with an asterisk (*) have been kindly gifted for consideration.